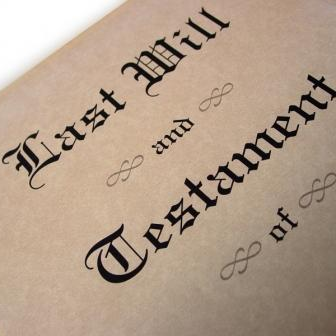 Death is a subject that no one likes to discuss – be it that of a family member or our own. Unfortunately, it's a part of life that we'll all have to deal with at one point or another. When it comes to preparing for your own death, however, what's left behind in the digital space is often overlooked. Considering our digital life is becoming such an important part of who we are and the legacy we leave behind, a simple way to manage what should happen to our data in the event our passing is quickly becoming requisite. 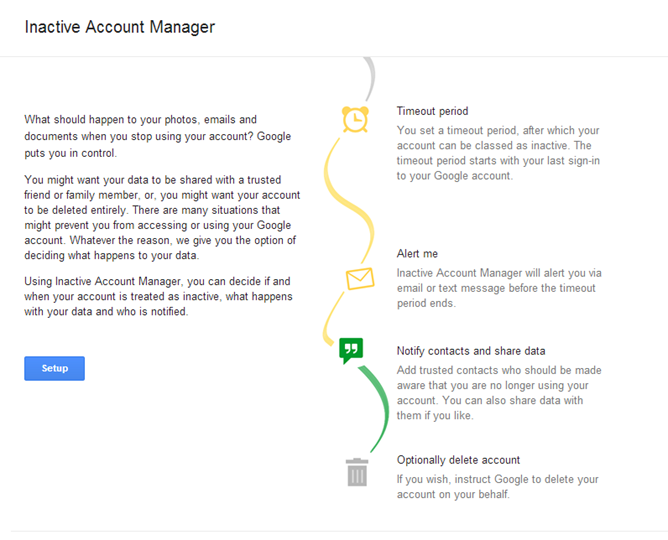 Thankfully, Google has unveiled the Inactive Account Manager, a service that looks to provide just that. Think of IAM as a digital will of sorts – it essentially lets Google know what to do with your personal information, including "+1s; Blogger; Contacts and Circles; Drive; Gmail; Google+ Profiles, Pages and Streams; Picasa Web Albums; Google Voice, and YouTube" in the event that you fail to login for an extended period of time. You can opt to either allow trusted contacts to obtain the data or have it completely removed after three, six, nine, or twelve months. Don't worry, though – Google will send you an email and a text message before the data is deleted or turned over to your designated contact (your digital beneficiary, if you will), just in case you're still alive and just haven't logged into your account in a while. Having recently faced the death of someone close to me, this is something that has been on my mind fairly often as of late – with so much automation in our online lives, sometimes reminders of a loved one's passing is difficult to keep out of sight. I'm glad to see Google take a step towards alleviating a small part of the difficulties that come with death, which protects both the living and the deceased. 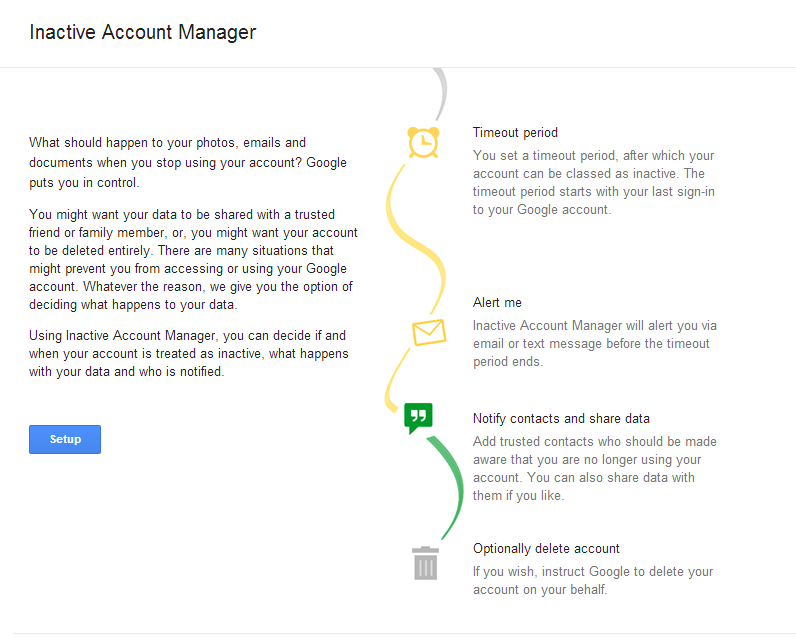 To set your Inactive Account Manager up, head here.